There are a lot of options for protecting your body from the impact of a hard or awkward fall, but not many options to do it with a minimal amount of bulk (which can hinder performance). G-Form allows you to protect yourself and your gadgets with something called RPT™ (Reactive Protection Technology), a soft, flexible technology that stiffens to absorb over 90% of the energy from high-speed impact. G-Form can add a little more confidence when kick-flipping a 20-stair or dropping into steep singletrack. Or in my case, snowboarding in thin-cover conditions at Snowbird in early December. 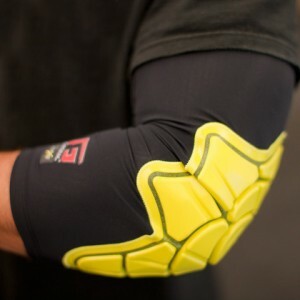 I wore the G-Form elbow pads, described as a “flexible, molded, exoskeleton rate-dependent impact pad worn on the outside of the sleeve.” The ridges and hinges of the pad are specifically designed to flex with the elbow and arm to ensure complete protection. G-Form elbow, shin and knee pads have a thin rubberized edge that allow it to grab on to your skin to prevent slipping. I found that flipping these edges inside-out allow you to pull the pad on more easily and then, once in place, flip the edges back down so the rubber contacts your skin. There was very little movement of the pads over the course of the day and I only made minor adjustments during a quick lunch break. The G-Form elbow pads did there job on more than a handful of falls and will be a regular part of my gear for snowboarding, mountain biking and downhill skateboarding. I’ve written about d3o in the past and this product is similar, but G-From simply does more with less. G-Form’s RPT is a proprietary composite construction made-up of durable layered materials. This allows G-Form to be directly exposed, whereas d3o is almost always inside of a pocket or under a layer of fabric or foam. With a lighter weight base material and special co-molded construction, G-Form RPT can “outperform d30 in many ways,” according to G-Form VP of Innovations Thomas Cafaro. “Compared to d3o, G-Form RPT has better abrasion properties, a higher tear strength and can handle laundering much better.” G-Form’s impact test results claim to reduce force transfer better than d3o and does so with less weight, less thickness and at a lower retail price. If your looking to boost your confidence, protect yourself from bodily harm and want to cut-down on the bulk of traditional pads, consider G-Force. They’re light, affordable and offer great protection using state-of-the-art technology. Note: I’ve also been testing the G-Force Extreme Portfolio™ for iPad 1 or 2/10″ Tablet and while I haven’t dropped any bowling balls on it (or from an airplane), the case gives me peace-of-mind and it looks badass!